I spent last week in Ashland, Oregon, attending Design Outside the Lines and it was great! At the retreat I made this coat, the "Jean Cacicedo Coat". First, I'll talk about the coat, and then give a brief recap of Ashland DOL, Oct 2015. Diane Ericson is (very soon) releasing a new pattern in her Revisions line, called the Jean Cacicedo Coat. She made an early copy of the pattern available to interested DOL participants. (It's not yet on her site, so stay tuned.) You may recall that I purchased three remnants of double-sided wool when I visited the Mill End Store in Portland last spring. Three remnants of double-sided wool coating. Note that the cellist is wearing a black tux and playing a white cello. 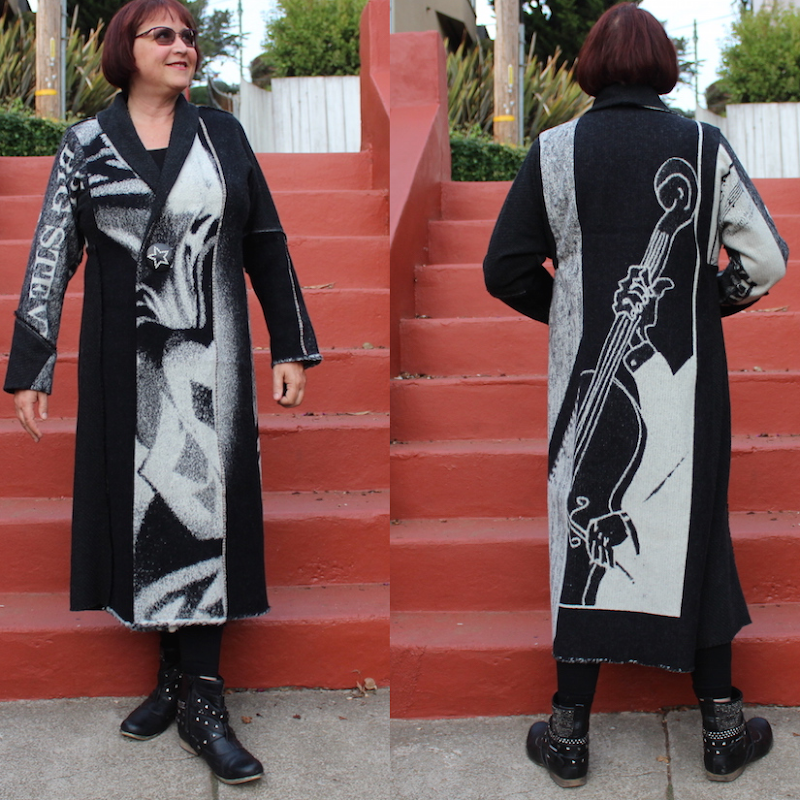 For my coat, I preferred the other side, where the cellist is wearing a white tux and playing a black cello. That makes my cellist left handed, but I'm left handed, so that is fine by me! I wanted to use these in a coat, but I was not sure how to go about it. I brought them to DOL, sure that I would use them somehow. I was not sure which companion fabrics to include, so I filled the back of my van with many possibilities—lots of black and grey fabrics, and a few reds. Only one fabric worked—a charcoal grey textured wool with a pretty selvedge. It was a relief to use a fabric that I brought—I was about to give up and buy something from the fabric store across the street, when Carol Lee helped me look through them again. I had also brought a tote bag full of coat patterns, just in case, but the second I saw the Jean Cacicedo pattern, that was it. Love at first sight. The sleeve tapers pleasingly at the wrist. The coat is unlined, but it would not be hard to draft a lining. The coat runs from XS to 3XL. I traced off an XL in the longer length. I omitted the patch pockets and appliqués, so only three pattern pieces were required: body, sleeve, and collar facing. Because I was collaging my coat, I needed a base fabric. When Diane made her version, she used Thinsulate batting as a base, but my coatings were heavy and I didn't want anything as beefy as Thinsulate. I didn't bring a suitable base fabric, so I ran across the street to the fabric store and bought 8 yards of sew-in Pellon interfacing. Pellon is not particularly wide—about 24"—I seamed it together to make a single piece of fabric large enough for the coat body. Omitted the patch pockets. On the left side of the coat, two fabrics were joined in about the right location for a side seam, if there had been a side seam. I used this opportunity to insert a single-layer side pocket. I did not put a pocket on the right side of the coat. The collar facing has a 1-1 correspondence with the coat collar—there is no allowance for turn of the cloth. Be sure to allow for this if you are using a beefy fabric. I did not read the instructions, so I am not sure what kind of closure the pattern calls for. I closed the coat with a large snap. I cut the body of the coat from the seamed Pellon and began laying down the fabrics, starting with the cello (or is it a bass?) at the center back. The fabric had a nice selvedge, so I placed it 3" from the bottom of the Pellon, where the finished hemline would be. I filled in the gaps with the charcoal wool, using the selvedges wherever possible. Once the coat body was pieced, I ripped out the Pellon and discarded it. After the body of the coat was complete, I evaluated the remaining pieces of the coating. One remnant was woven with the words "Big Steve &". Who is "Big Steve", exactly? I googled but was unable to figure it out. Based on this coating, "Big Steve &" is a musical group that includes a cello (or is it a base?). I wanted to use the text "Big Steve" on the sleeve. Once the sleeves were completed, I had only tiny pieces left of the coating. I considered putting them on the facing, but decided it would be too busy, so the facings use only the textured grey wool. As I mentioned, I closed the coat with a single large snap. I found a large pendant in the bead store in Ashland, and decided to use it on the coat. I attached a button-shank to the back of the pendant and sewed it to the coat as a non-functioning, decorative button. Finally, to create a better line, I inserted 1/2" shoulder pads. And that's it! The coat pattern is a quick sew but, because collaging took time, and I included lots of handwork inside the coat, this was my only project of the retreat. You may recall that, almost exactly three years ago, I attended Taos DOL 2012. It was the last Taos DOL where Marcy Tilton and Diane Ericson taught together, and I was so glad to experience the team who originated DOL. Opening circle with Marta, Diane, Cathy, and Gwen. The retreat took place in the historic Ashland Springs Hotel. After Marcy retired from DOL, it was hard to imagine who Diane would bring in as a replacement, but she had a brilliant idea: For each DOL, she invites a different fiber artist to join her as guest teacher. Her list of past and future guest teachers includes Nancy Shriber, Holly Badgley, Jilli Blackwood, and Karen Nicol. The guest teacher for this DOL (and also for last fall) was Carol Lee Shanks. Carol lives in the Bay Area and, while I had heard of her, we had never met. The theme for the retreat was "My Coat: Creating a Personal Shelter." Since coats are one of my favorite things to sew, and I'd heard great things about Carol as guest teacher, I signed up. The general format of a full day at DOL is this: we ("we" being the 20 participants and "angel helper", Gwen Spencer) convene in our temporary studio in the hotel at 9am. Part of the room is set up for lecturing with a rack of clothing and a dress form that the teachers use for show and tell. Diane speaks for about an hour on a topic designed to inspire creativity. The guest teacher talks for about an hour on her process. We settle in to our sewing area and get working. Several times throughout the day, we reconvene for a quick talk or demo. Topics included a stenciling demo, and Diane's approach to refashioning. One day Diane's son, Miles Frode, came by to demo how he creates his painted and stenciled textiles. Diane had a number of his pieces for sale. Such beautiful bark-like back detail! 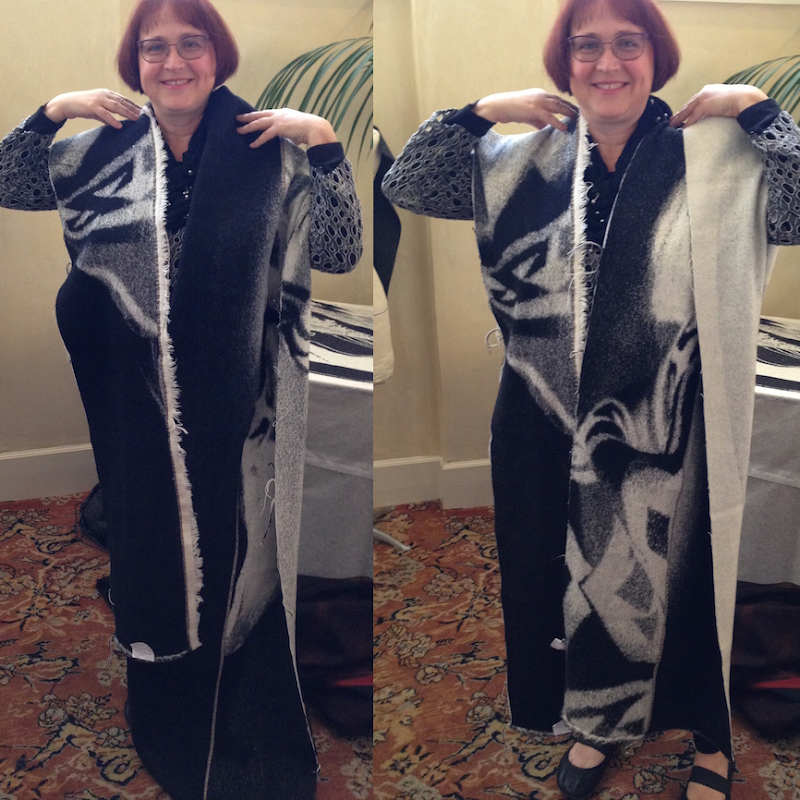 Carol showing us one of her designs that combines a stiff-ish fabric with a drapey fabric. Carol's approach to design uses simple shapes—rectangles, triangles, circles—combined with her deep understanding of proportion. She walked us through how she works and showed us pieces made from the same fabric, using the same technique, but resulting in very different garments. This approach to design intrigued many at the retreat who used her technique to create beautiful (and very different) garments. Diane's studio is several blocks from the hotel, and most of us walked over to visit at lunchtime. Diane shares her studio with Nuno felt artist, JoAnn Manzone. Some of her work is for sale in a corner of the studio, as well as Diane's patterns, books, cards, and supplies. Diane knows a woman in New Mexico who raises alpacas. She has their wool needle felted into gorgeous yardage. I am thinking of felting this fabric further, to make it more stable. A few final pictures from my time in Ashland. Across from our hotel were two, TWO, independent fabric stores! In the same block! Along the same street is a bead store, and a couple consignment stores. At the end of the street is a fabulous yarn store that also sells wearable art in the front. Sandie, my sewing table neighbor. Sandie's talents extend to metal folding. She made the pendant she is wearing. Ashland, and especially Lithia Park, was wonderful for this fall-foliage-deprived San Franciscan! This pic is getting me in the mood for Christmas! The coat leaves me just... breathless! What beautiful work! Great to see you while you were in Ashland! Loved seeing the coat in process and love seeing the completed work even more. Thanks for showing it to us! I so enjoyed meeting you, Susan! Thanks for reaching out! The coat is amazing. Ashland looks like a wonderful place to create. Spectacular! Thanks for sharing all of the pictures and your coat-making process! What a coat!!!! What a retreat!!! What a fab week you had! It makes me want to finish my coat from last year!!! Totally inspiring! Whoopee!!!! That coat is simply glorious! You'll have fun wearing it. Your coat is fabulous. Thanks for letting us in on your great retreat. Nothing more inspirational than being with kindred spirits. I just saw your coat over at Pattern Review, words do not properly describe how beautiful I think your coat is--it is just incredible. It looks like you had a wonderful time working on it too. Oh what a great post! I love seeing all the pics of your work, work in progress and everyone who attended. I can pretend I was there! It looks like it was loads of fun...as usual! Thanks for this little trip on a Sunday afternoon! Stunning, Shams! I love how the you put the collage pieces together perfectly! (and when I saw the Big Steve sleeve I was jealous...my son, Steve, is 6'-5". Wouldn't it be fun to have a coat with Big Steve on the sleeve?) I think I have to put DOL on my bucket list. Thanks for sharing your coat with us wannabes. Well, you have your outfit now for next year's Artistry in Fashion! Such a fabulous, coat... love it!!! Sounds like a wonderful week. And your coat is amazing! I. LOVE. EVERYTHING! About. This Coat!!! The pattern looks very intriguing - can't wait to see your coat in person and get the pattern myself! The use of the selvedges, the pendant/button, the fabric, your collaging, your changes... GAWjuss!!! That is a seriously awesome coat! A beautiful sculpture, made from stunning cloth....fabulous coat that you wear so well. Unique and fabulous coat and it suits you perfectly. Fabulous coat--one of your best pieces, IMHO. The pattern is interesting, DOL sounds interesting. That coat is a work of genius. Possibly your best? Certainly in contention, and that is insanely high praise, given your body of work. We're getting in the 'artists portfolio' territory here, dear! Glad you quickly marinated these 'stash' panels into awesomeness! The coat is Awesome. I love how you make the fabric come alive! fantastic coat, perfect choice of a simple pattern and the print placement is perfect. Absolutely wonderful! One question... maybe i missed this, but I double checked... did you overlap the different fabrics and sew them flat? I suppose they didn't ravel. I imagine you must have, but just wanted to ask in case I ever bring myself to experiment. thanks for sharing your great work! Hi Kate! All of the fabrics ravelled like *crazy*. I turned under the raw edges and hand sewed most of the seams. On the inside, I finished all raw edges by hand. As always, I am blown away by your brilliance combining textiles. Your coat is the most amazing I've seen! What joy to be able to create something so unique. bass fiddle OR a cello strummed like a bass, but who cares? that coat is wonderful. thanks for sharing the process. Love it-Love it-Love it!! A one-of-a-kind work of art. I'm in awe. Awesome. Coat. The fabric and how you used it is amazing. I have looked at the photos over and over. I always enjoy your DOL posts. Your shadow upon the leaves is a beautiful photo. Great post! It was lovely to meet you at AIF, Joan! Shams, I hope you bring that coat with you when you come to Haute Couture in Stockton in Feb. It is fabulous! Will do, Sue! I look forward to it! Fantastic coat. Love the use of the images. Thank you for the class highlights. I'm going to my first DOL next year and can hardly wait. Thought of you yesterday while in Corning New York as a client started to talk about Google. Have a great Thanksgiving. You will LOVE it, Michelle! What a wonderful coat. Looks like such a fun gathering. Great looking coat! What unique fabric, so very you! Enjoyed photos of the DOL retreat. Wonderful coat Shams. You are so talented ! I have been working with the Textile Arts Council @ the de Young Museum. I found your blog while researching Jean Caciedo. I'm writing about my days producing the Obiko shows in the 80's & 90's. I would like to talk to you. Thank you. Styrous, I would love to speak with you! My email is toofunny2 at gmail dot com.